A neighborhood group in Greeley, working with University of Denver’s Environmental Law Clinic, has filed a lawsuit against the Colorado Oil and Gas Conservation Commission alleging that the state agency is not following its own regulations to protect neighborhoods. Extraction Oil and Gas Inc. received COGCC approval in October and has already graded the project area and bulldozed a new access road to the site. 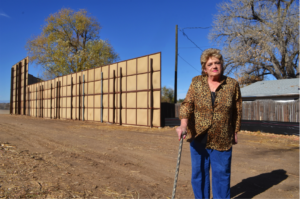 It has also set up 16 and 32-foot walls around the home of Dawn Stein whose property is only 15-feet from the new oil and gas access route. “They have turned my home into a prison,” stated Stein. “My view of the mountains to the west is now a 32-foot high wall.” Extraction estimates that drilling and fracking the 22 wells will require more than 50,000 vehicles entering or exiting the access route – 24 hours a day, seven days a week. ***See attached table and photos. Extraction Oil and Gas has stated that its drilling operations will start in December and will likely extend through 2018. Each well will extend 2.5 mile horizontally – the longest laterals ever drilled in Colorado. Initially, the group of neighbors that calls itself “Neighbors Affected by Triple Creek” was hopeful. In June, the COGCC announced that new “Large Urban Mitigation Area” rules (a.k.a. “Neighborhood Drilling rules”) would be applied to Extraction’s proposed “Triple Creek” site located in a residential neighborhood in Greeley. The new rules, passed in January, were the most substantive outcome of the Governor’s Oil and Gas Task Force and were meant to ensure that large oil and gas facilities (more than 8 wells at a location) may only be located in residential areas as a last resort. The rules require 1) an alternative location analysis to determine if a location farther from homes is available and 2) the use of “best available technologies” in the event there were no better sites and the oil and gas facilities had to be located near homes. Extraction initially promised neighbors it would use an oil pipeline but then rescinded that promise due to financial concerns when oil plummeted to below $50 / barrel. The COGCC has steadfastly maintained that, despite its new regulations, it will not require the use of pipelines or an off-site production facility if there will be an additional cost to the operator. Just last month, Extraction went public and raised a surprising $633 million from their initial public offering. That was $120 million more than Extraction had expected. Last week, Extraction’s project manager Blane Thingelstad told the Greeley Tribune that oil pipelines were going to be brought to the location, “It’s just a matter of when,” he said. The group is also appealing to Governor Hickenlooper to intervene. 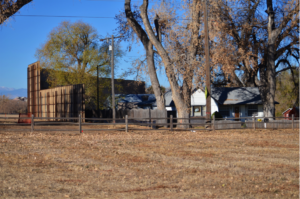 “If the COGCC is not following its rules to protect neighborhoods in Greeley, they are not likely to protect neighborhoods in Longmont, Erie, Broomfield, or even Denver. Just imagine the new neighborhood groups that the Governor and the COGCC will get to know,” Lewis stated wryly.